We should be really grateful we live in the post-shot clock era because basketball must have been the most boring sport to watch before that. 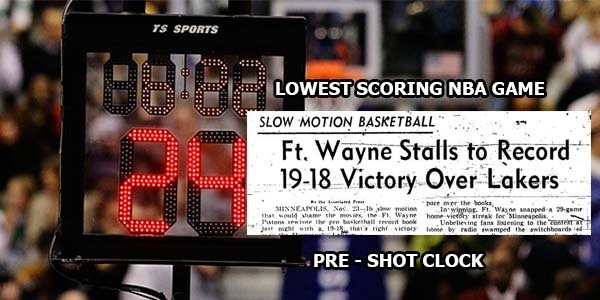 The lowest scoring game in NBA history took place on November 22 1950, with the Fort Wayne Pistons beating the Minneapolis Lakers 19-18. George Mikan scored 15 for the Lakers with only 2 other players getting a bucket. For the Pistons, nobody scored over five.